Lucky mugs are the perfect DIY craft idea for St. Patrick’s Day! 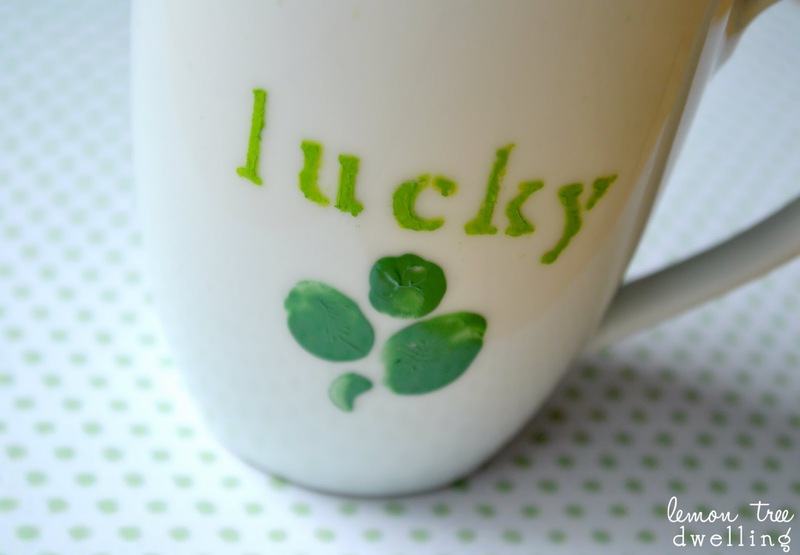 These hand painted coffee mugs are a fun and inexpensive craft to give a little luck of the Irish to your favorite someone. One of the things I love about St. Patrick’s Day is that it’s a holiday free from the expectation of gifts. 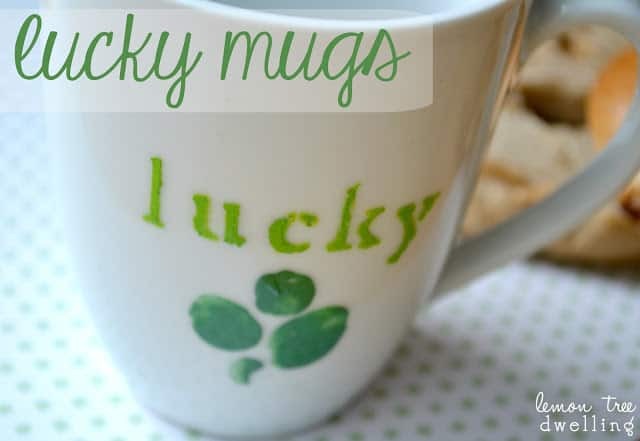 And yet…since it’s a holiday, and we love to give gifts on holidays, we decided to make these lucky mugs for a few “lucky” people in our lives! 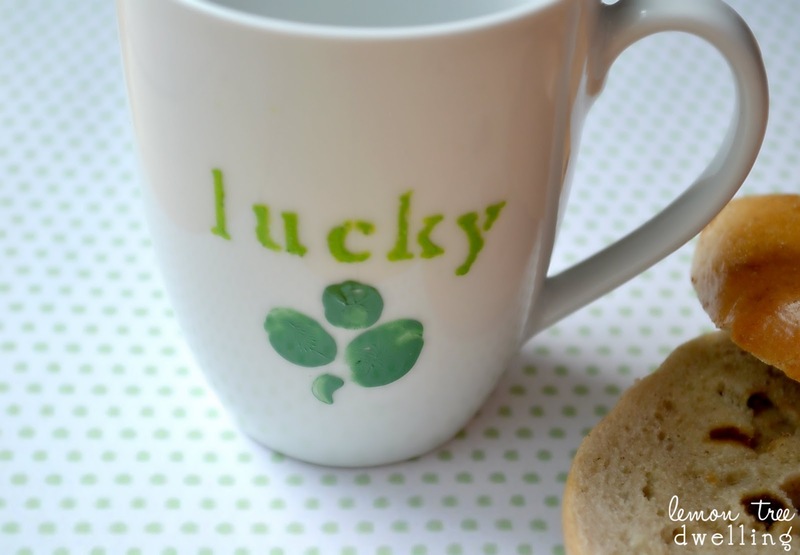 Lucky mugs! 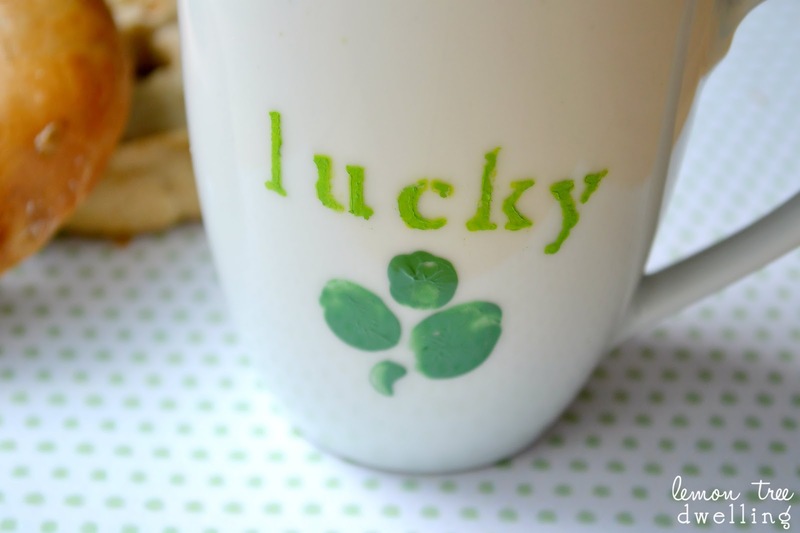 Actually, I tend to think that all mugs are lucky. I can recall numerous times in my life when the ONLY thing that got me out of bed was the promise of a strong cup of coffee (or three!!) Like every time I’ve had a newborn…or anytime I’ve had a kid who was up sick in the middle of the night. Or how about the year we moved into a fixer-upper when I was 7 months pregnant!? Yep, at times like these, a warm mug in my hands makes me feel like the luckiest girl in the world. That and maybe a cupcake with Baileys Buttercream Frosting. See, I think luck is about so much more than winning the lottery or making it big. I think luck is about all the small things that get us out of bed in the morning! Like our family, our friends, our work, our hobbies, our passions…. and, in a very literal sense (mine pull me out of bed every single morning), our kids! 1. Wash & dry mug, then wipe the area to be painted with alcohol. Let dry completely. 2. 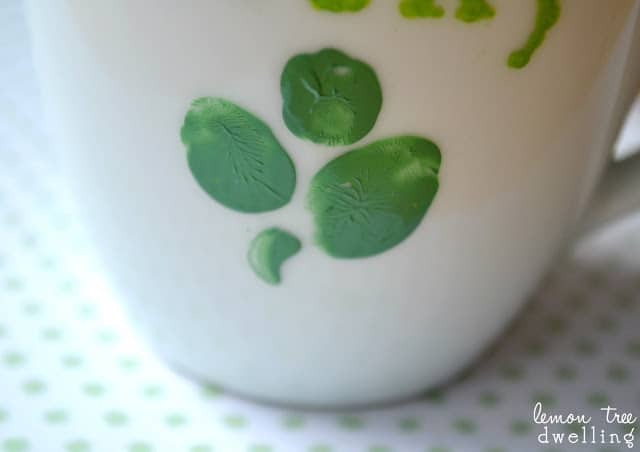 Use fingerprints to make the shamrock (each of my kids made one leaf) and use a paintbrush to make a stem. 3. Let the shamrock dry completely. 5. 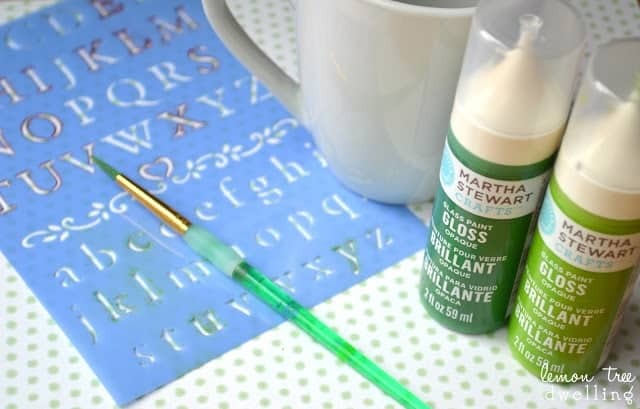 Let the paint dry completely between letters. Looking for other kid-friendly gift ideas? Check out my XOXO Framed Art! For more fun St. Patrick’s Day DIY craft ideas, check out this post of 50 St. Patrick’s Day crafts and recipes! Thanks, Marilyn! They were fun to make!! Cute to begin with, but the fingerprints put it over the top!!! Love it! Happy Monday from the enchanted oven. Awwwww…thanks Lisa! The fingerprints definitely make it extra special 🙂 Thanks for stopping by! Completely adorable! Love this idea 🙂 Pinned! Thanks, Trish!!! I appreciate it! LOVE THIS – super cute and what a lucky gift this would make! New follower over from the Clever Chicks. WOuld love for you to come visit my blog too! Thanks, Jessica! Yes, we are reserving them for a few “lucky” people 🙂 Thanks for stopping by and I will come visit you too!! Love these mugs! 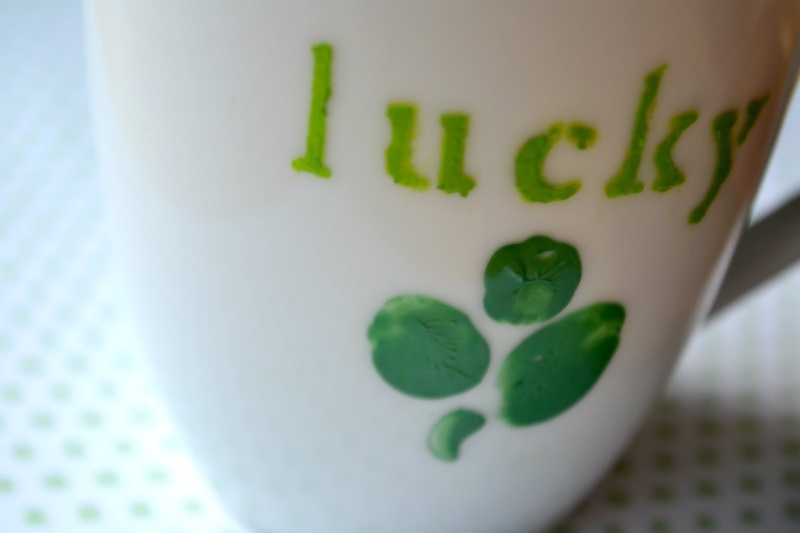 As a busy mom, grabbing a cup of coffee can sometimes be a “lucky” moment!. Pinned this great idea! I blog with a group of lovely ladies at thefriendcollective.com. We’d love for you to stop by! Very cute!!! I’ve decorated plates before but not mugs. Just in time for St. Patty’s Day! How fun! I love the fingerprints, and this would make the perfect gift for grandparents or anyone! OH my Cathy such a super idea! Love seasonal projects like this one! I”m your newest follower. I don’t think that I have ever been here! So cute and creative! I love it. Thank you so much for sharing at A Bouquet of Talent. Have a wonderful weekend!! I like green color and it seems to be the color of the year! Love this! I have two plain white mugs I’ve been saving for when I get a creative inspiration to paint them. This is such a cute idea! So cute and clever! Love! I featured it here! 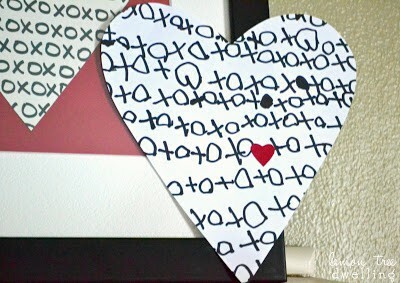 http://www.housewifeeclectic.com/2013/03/17-crafts-and-recipes-to-make-for-st.html, feel free to link up more posts! Such a cute idea for St. Patty’s day! So glad you shared @The Weekend re-Treat!